I have submitted my PhD thesis entitled 'Conservation Management of the Mountain Chicken Frog' which I undertook at the Institute of Zoology (Zoological Society of London), Durrell Wildlife Conservation Trust and the Durrell Institute of Conservation and Ecology (University of Kent). 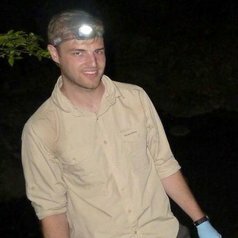 My PhD focusses on the emergence and impact of chytridiomycosis on the mountain chicken frog and the testing of two conservation approaches aimed at mitigating the ongoing impact of the disease. These were a worlds first reported use of an field based anti-fungal treatment and reintroductions of captive bred mountain chickens. This project is an important case study for interventions to tackle one of the greatest threats currently facing amphibians globally. I also have an MSc in Conservation Science from Imperial College London and a BSc in Biology from the University of Bath.